I rarely work with hardwoods anymore. Not that I even did it much to begin with. I’m totally content working with pine and you probably already know this. 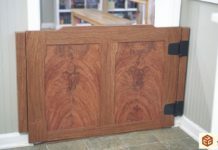 Not only do I live quite a drive from any place that sells hardwoods but because domestic hardwoods are not common to my area the price for purchasing hardwoods is pretty high compared to other areas of the country. Well, not as expensive as California but everything is expensive over there. A couple months ago I drove to Jackson Mississippi to check out a friend’s shop and a local hardwood store. I intended on getting some walnut but the selection wasn’t as nice as I had hoped for. I really didn’t want to leave empty handed so I picked up a beautiful 12′ board of 4/4 sapele. It was actually less expensive per board foot than walnut anyway. Fast forward a month or so and I got up a box of walnut from Matt Cremona. I had no clue what I was going to make with either of these hardwoods so they sat around for a bit. While recently driving to Kansas City for Woodworking In America I got the idea to combine both of these hardwoods in a small gift box for an upcoming wedding I will be attending. So if you see this before I see you, congratulations Holly and Brian! The gift box design I settled on is inspired from my recent blanket chest but with the attempt to add a subtle Asian flair. Before starting any project I make sure everything works out in SketchUp. 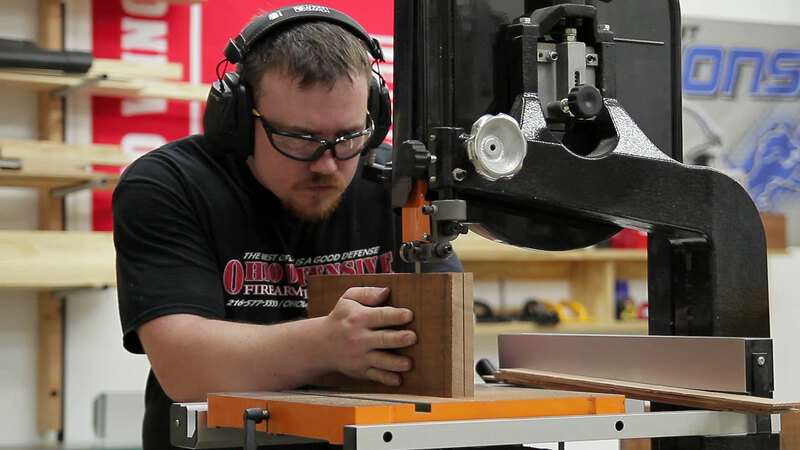 This allows me the opportunity to make any changes as well as virtually disassemble the project and layout all of the pieces in an efficient way that they will be cut according to the material I have for the project. 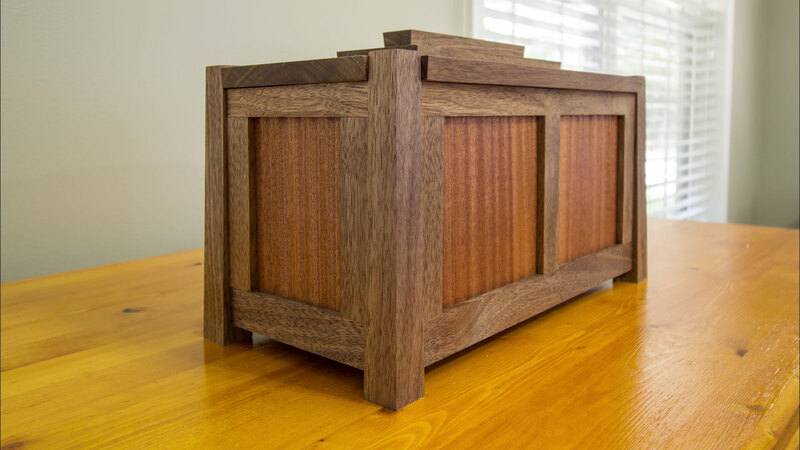 I settled on all of the structural components being walnut and the panels and interior tray were to be sapele. With a rough layout sketched on the material I can start breaking down the board into oversized pieces. Although I did rip a long strip of rift sawn material for the legs first the miter saw is my normal starting point for this step. 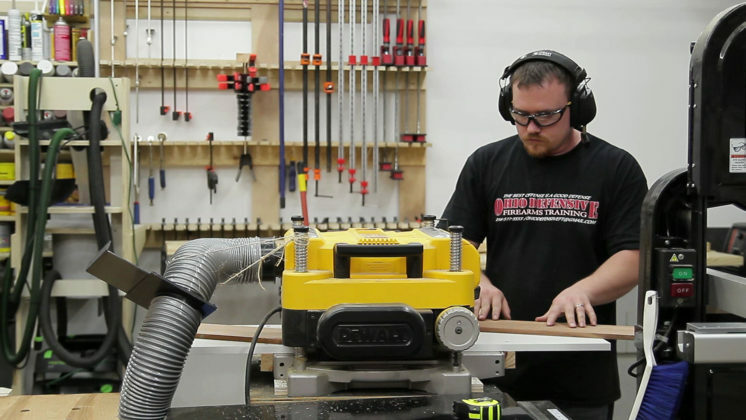 Having a dedicated miter saw station with material support on both sides that is always setup is an incredible convenience. Every time I’m in the shop this station gets used. 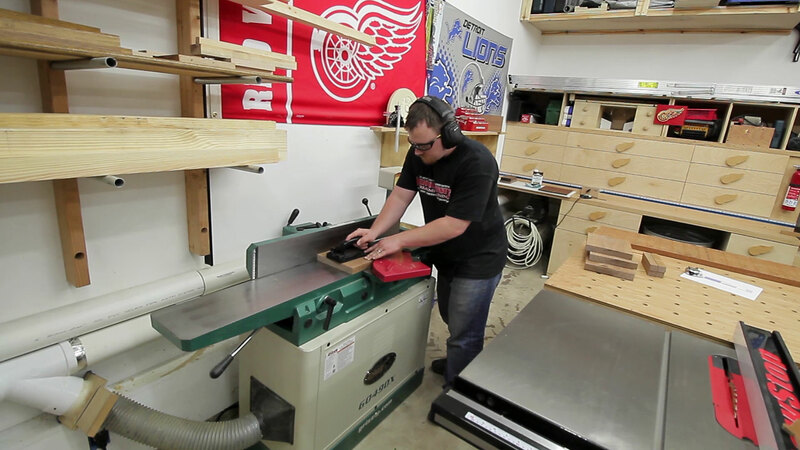 All of the material for this build is rough sawn so my newly acquired jointer is being put to good use. 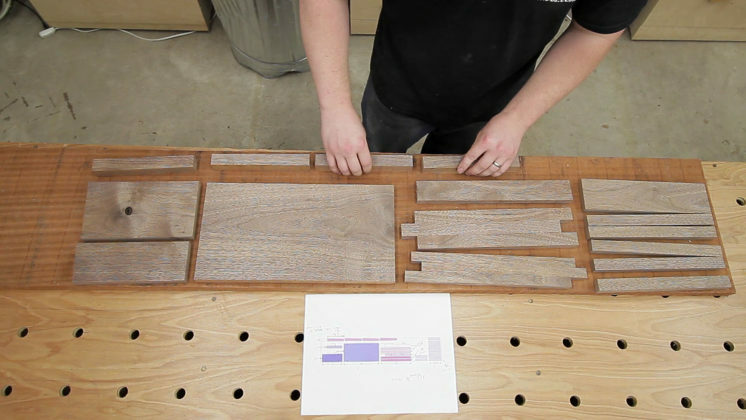 One wide face and one short face are jointed flat and 90 degrees before milling the individual parts. After using the full 8” width of this jointer on this step I’m glad I decided to go with a 8” jointer instead of the common 6” jointer. 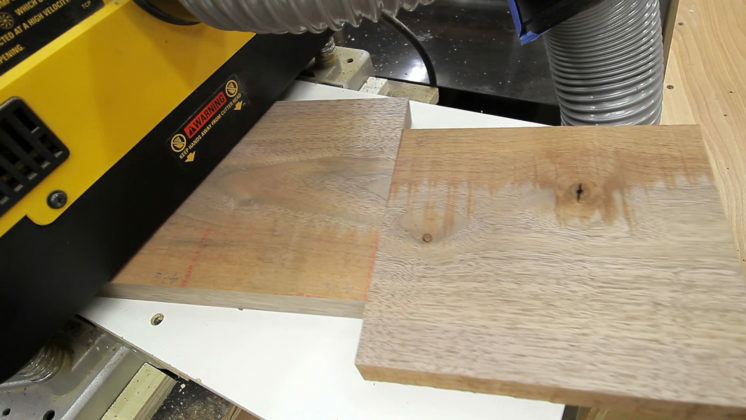 With two faces flat the opposite wide face is milled flat and parallel at the planer. The final thickness is also established here. You know that great feeling you get when you apply finish to a piece and the grain just pops out at you? I kinda get that same feeling when all of the rough sawn edges are removed and fresh, clean material is revealed underneath. 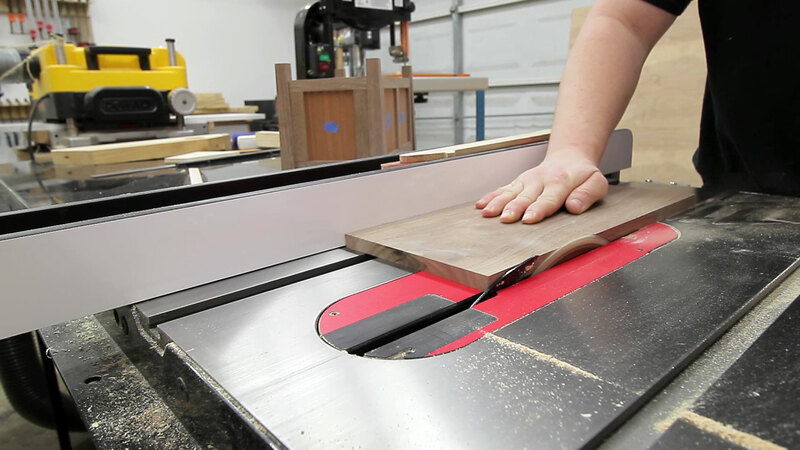 Then the table saw is used to cut the pieces to their final width. 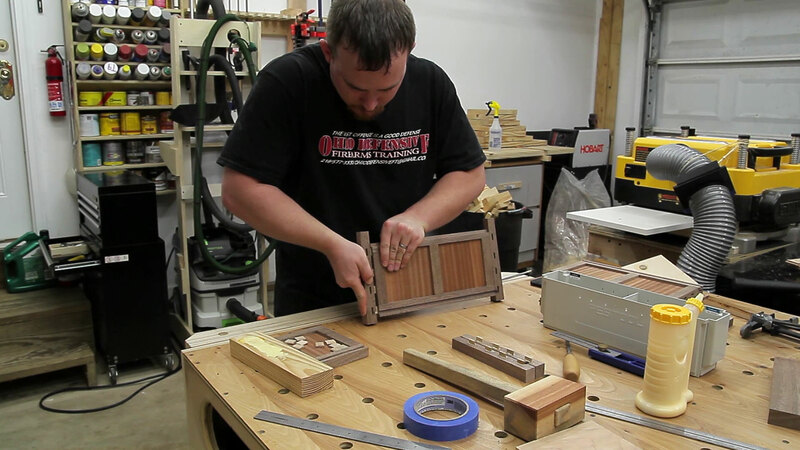 There’s quite a few pieces to cut for this little box. 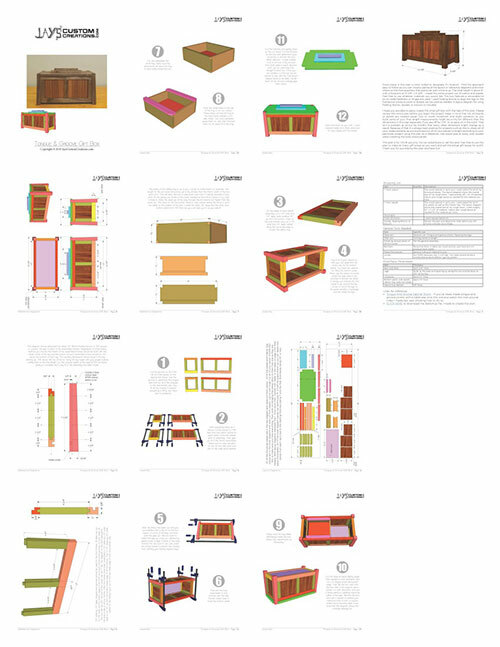 I find it very easy to accidentally lose track of what pieces were already cut and what pieces need to be cut so every time I go through this milling process I try to layout all of my pieces the same way as my cutting diagram shows them while I’m actually cutting. This way I can visually see what has and has not been cut instead of determining if “top-right frame rail” is in a particular pile of cut pieces. 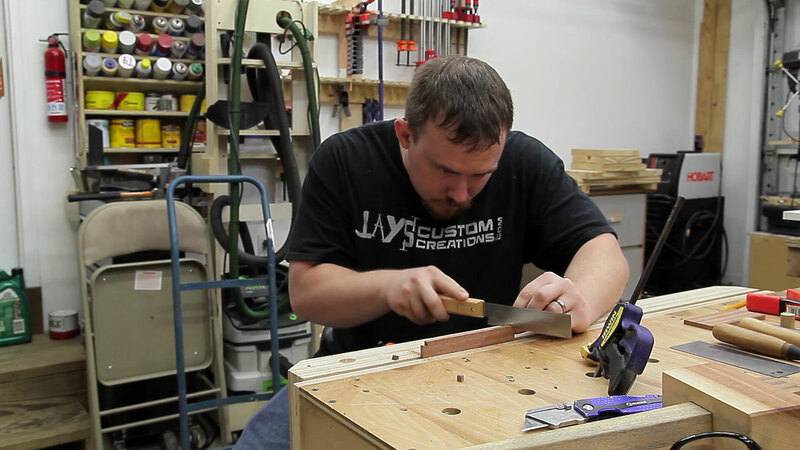 Just about every piece on this box is too small for the stop block setup on my miter saw station so I used a panel sled on my table saw to establish the part lengths. I actually prefer using a panel sled for final dimensioning of small parts anyway as it is a little more accurate for me and the cuts are nicer. At this point all of the frame pieces are cut to size. Before cutting the tongue and groove joinery I wanted to mill the sapele panels to their final thickness as they will determine the width of the groove. 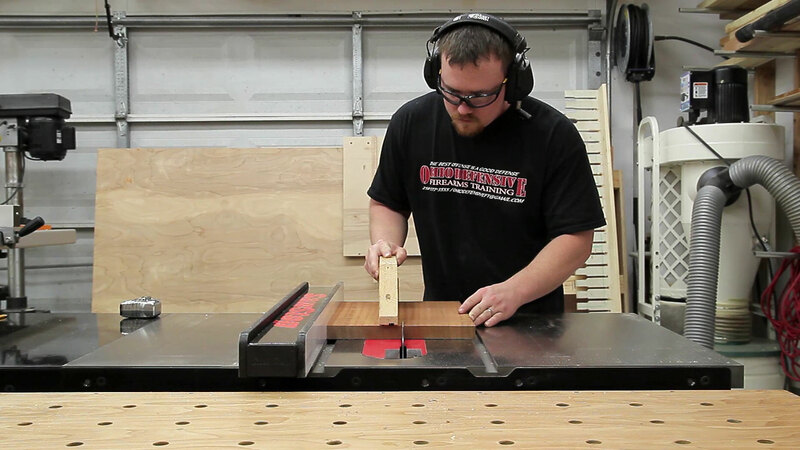 Because I’ll use my table saw to cut the groove I find it easier to mill the panel first instead of the groove first. 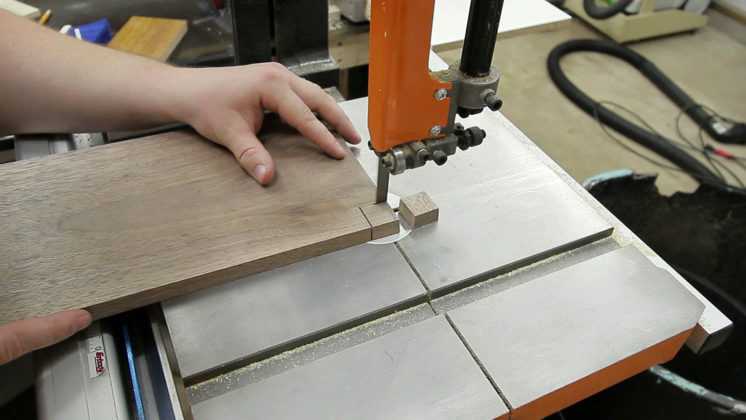 If I were using a rail and stile router bit set where the panel thickness is predetermined the process would be reversed. First I had to rip the sapele in half so it would fit in my bandsaw when resawing. The bandsaw blade I’m using to resaw is a 1/2” Wood Slicer resaw blade. During this process I was getting a crazy amount of blade drift. To compensate for this you just feed the material in on an angle matching the blade drift and you can get a nice straight cut. I thought this was due to the blade being pretty used and not sharp but as I’m typing this article I just took a break to go look at it and found the blade drift was due to the upper bearings moving out of position. Somehow the bearing lock loosened. I just fixed that and gave the saw a quick tune up so all is well now….but back to the project. I resawed the 4/4 sapele in half to get two panels from one thickness of the rough stock. The process is repeated for all of the parts. After resawing the jointer is next followed by the planer. I wasn’t concerned with the length and width at this stage. I just needed the panel material to be at it’s final thickness. 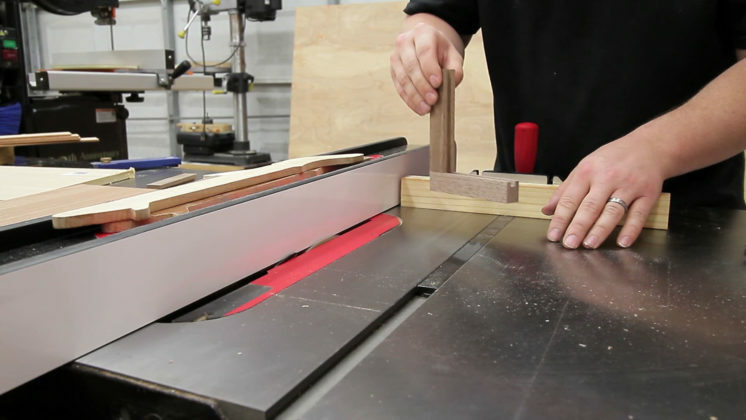 Whenever you are making tongue and groove joinery on the table saw it’s best to have a few pieces of scrap material go through the milling process with your actual pieces. The scrap pieces can then be used for tool setup to really dial in the width of the groove so you don’t mess up any of your actual pieces. With the scrap piece yielding good results the rest of the joinery can be cut. All of the grooves are cut first. Because the small size of this project and the small size of the groove I didn’t bother with setting up a dado blade for any of this. I instead took multiple passes with the regular table saw blade. 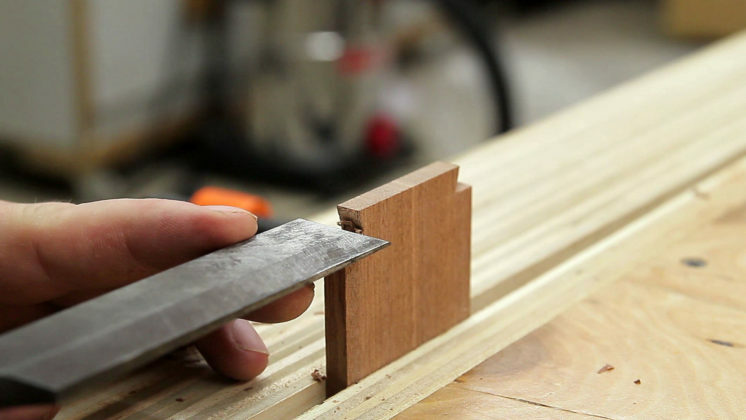 This blade has an alternating tooth bevel so the bottom of the groove is not perfectly flat. This is alright as it doesn’t matter for this application. 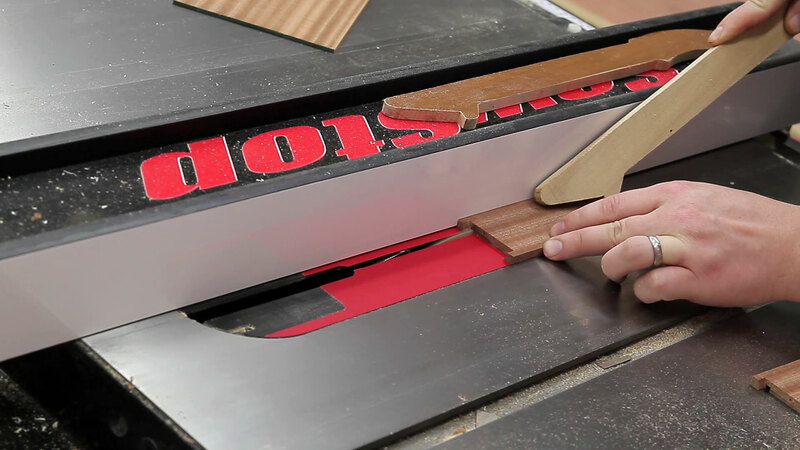 The same blade in conjunction with the miter gauge is used to cut the tongues. Again, the test block is used first to determine the machine positioning. I like to go for a fit that is easily pushed together but will hold against gravity. Then all of the tongues are cut. These pieces are quite a bit smaller than what I’m used to. With all of the tongue and groove joinery cut and the frames test assembled the final dimensions of the panels are determined. My one sided panel sled is used again for this. 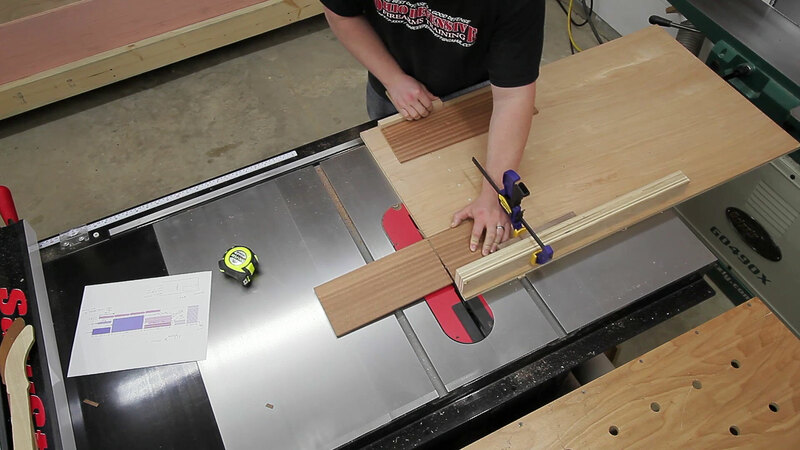 I always prefer a one sided cutoff sled instead of the traditional two sided crosscut sled. The offcut piece is harmlessly dropped onto the table and I’ve never, ever, had any of the pieces fly back. The main reason I like this sled is it almost always forces you to stand to one side instead of in the direct path of the blade. This greatly reduces the amount of dust that is thrown in your face as well as reduces the chances of you being in the line of fire should something actually get thrown back. 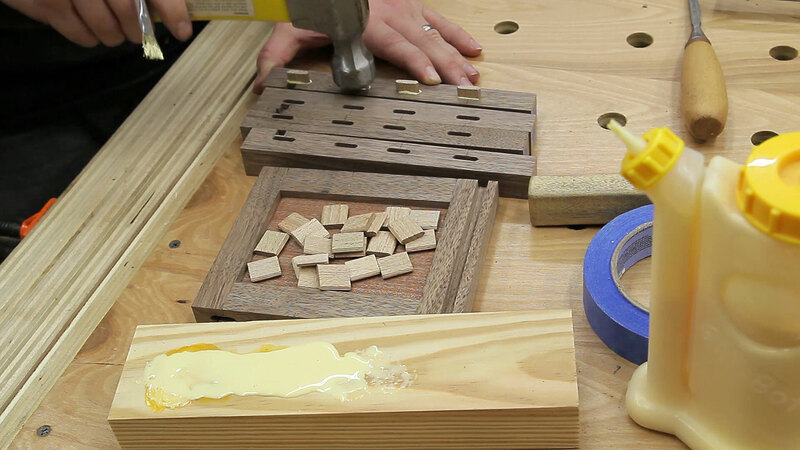 The frames are glued together with regular wood glue and only on the tongues. The panels do not receive any glue to allow for expansion and contraction. Before assembling the legs and assembled frames I cut a rabbet near the bottom edge of all the frames to accept the bottom panel. I also cut a rabbet along the top inside edge of the long frames to accept a sliding tray later. This is where the design starts to change a little from my recent blanket chest. Looking back on it, I really wish I would have done this and added a tray to the blanket chest. For the main construction joinery I went with floating tenons. I’ve recently got a lot of questions from others asking what tool I’m using for this. It’s the Festool Domino DF500. It’s quite expensive but it does the job incredibly well. There are plenty of other options out there and I’d definitely not consider it a “must have” tool by any means but if you are wanting strong, invisible joinery that is crazy fast and precise it’s definitely a game changer. But because this connection will ultimately be a long grain to long grain joint a regular, inexpensive biscuit joiner will do the job just fine here. 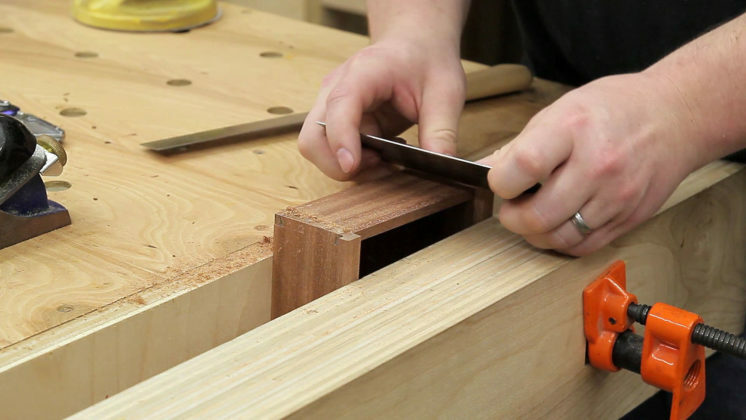 In this application, the floating tenons I am using are mainly for alignment purposes during the main glue-up. 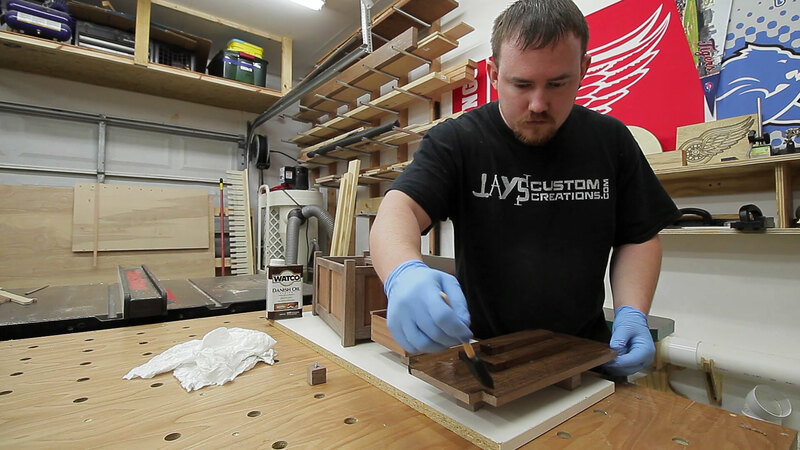 A couple more tasks must be completed before the glue-up. With a dry assembly the bottom panel size can be determined and the location for the leg notches can be marked. 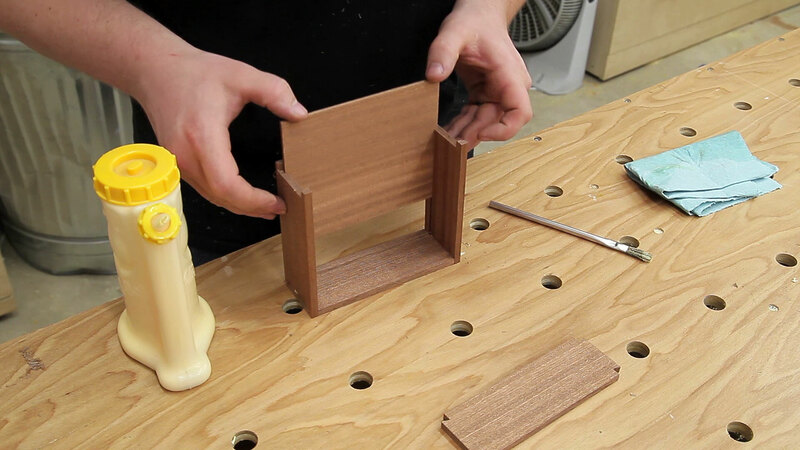 The legs must be notched to accept the bottom panel. Notching the legs is pretty straight forward. Just a 1/4” chisel doing it’s job. Finally, I tapered the legs on both outside faces. I contemplated making curved legs on this project to add a little more Asian inspiration but I didn’t have much material to work with as the parts are pretty small and I really didn’t feel like milling a new leg in the event that I screwed up somehow with the curves. I used my multi-function table saw sled for this. The main glue-up starts with gluing the floating tenons into the legs. 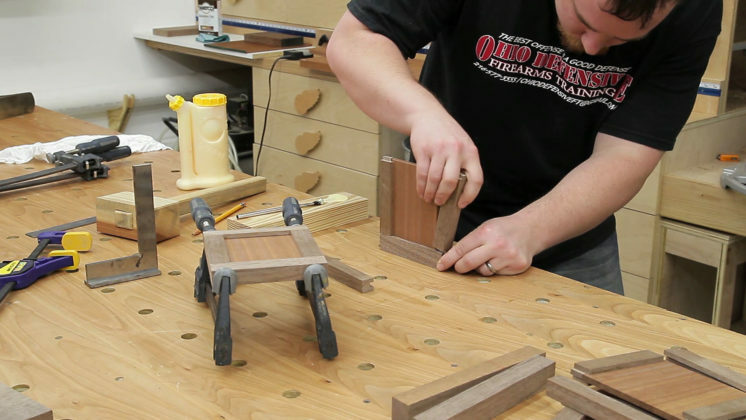 Then adding two legs to each of the long frames. The entire glue up could probably be done in one step but I chose to break it in half. After the long frames and legs are out of the clamps the assembly could be completed with the short frames and the bottom panel. I wanted the lid to be a stacked assembly similar to traditional Asian architecture but I didn’t want to go overboard with it. I still wanted it to feel like it fit with the rest of the project. So I went with a simple 5 degree bevel on all of the lid assembly pieces. Cutting them to width first. Then crosscutting everything to the final length. I didn’t show it on the video but I cut the lid oversized at first. Then after notching out for the legs I took equal amounts off each side until I was satisfied with the look. I actually trimmed down the lid about three or four times before getting it the way I wanted. Rewind just a little bit to immediately after cutting the oversized lid. I didn’t want to just duplicate my recent blanket chest so for this lid I decided to leave the legs 1/16” or so proud of the top side of the lid. 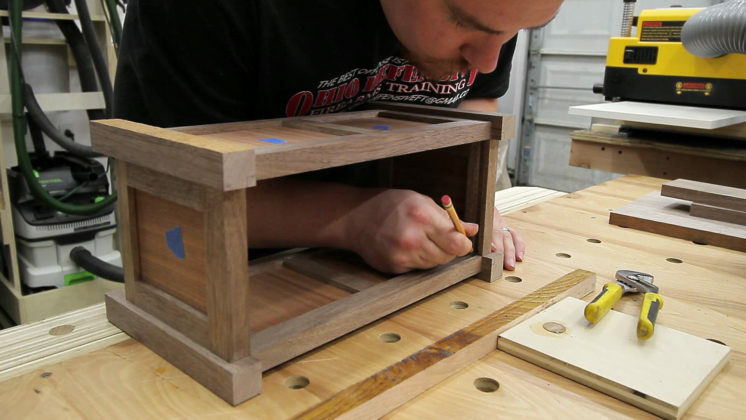 Doing so requires the lid to be notched out to fit around the legs. 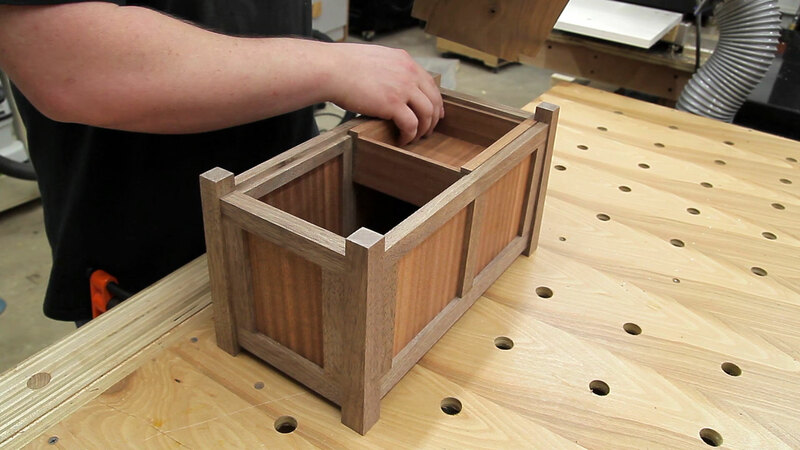 This will also hold the lid in place without any hinges or metal fasteners. I flipped the box upside down on the bottom face of the lid and traced the inside corners of the legs. 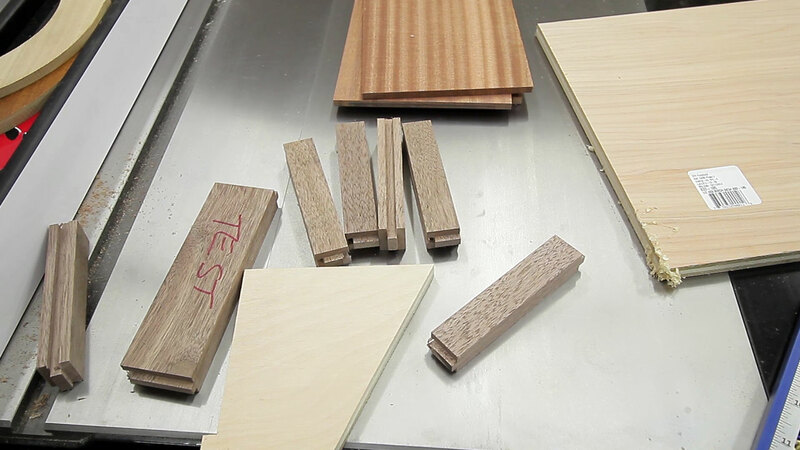 Then went super slow at the bandsaw to cut out these notches. At that time I still had a lot of blade drift so I was really trying to not screw it up. Going slow also results in a smoother cut that requires less smoothing. The stacked lid assembly was made up of three pieces. 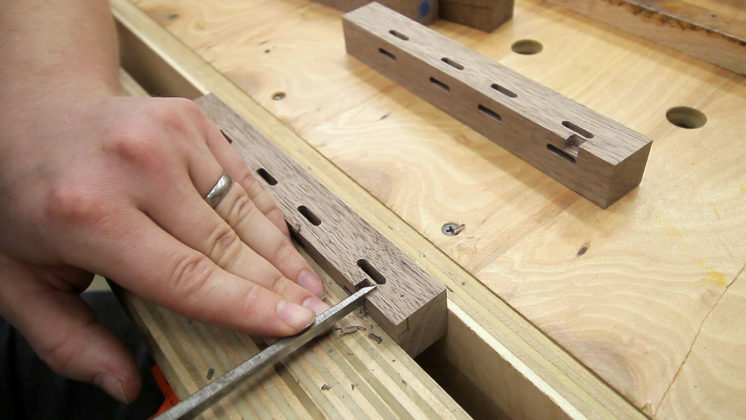 Each piece gets smaller in length and width and has the same 5 degree bevel all the way around. A little glue, careful placement, and a paint can for a clamp secures everything in place. While making a gift instead of buying a gift does feel a little more personal I wanted to add a bit more of a personal touch. 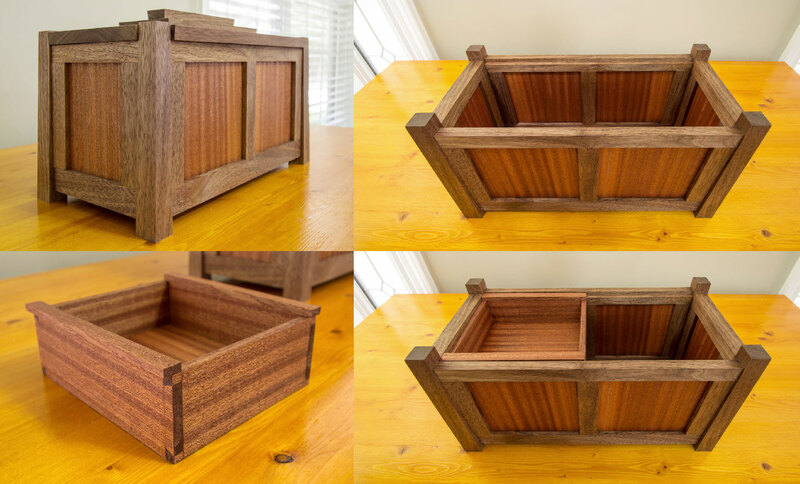 So for that I decided to put together a small hand cut dovetail tray to go on the inside. I’m not a hand tool or hand cut kinda guy at all but I do enjoy venturing on unfamiliar paths from time to time and trying something new. I’ve also been really inspired and motivated by Matt Cremona’s recent crazy super amazingly awesome secretary that he completed. Seeing him complete a masterpiece of that magnitude has really inspired me to push a little further with my projects. 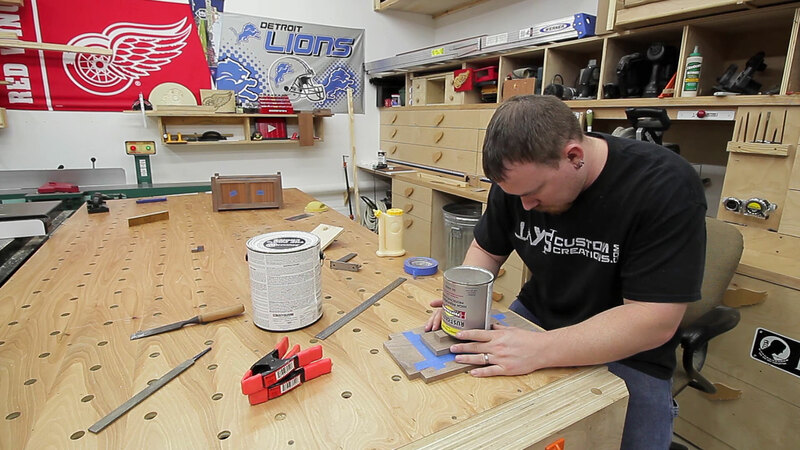 So for the tray I started cutting the tails with my Harbor Freight flush trim saw. And cleaned them up with a few chisels. I haven’t invested much money in my hand tool set so hopefully this is a reminder that you can indeed make good work without investing a lot into a shop. I’m using a $10 set of chisels for this that I picked up on Amazon a couple years ago. Nothing fancy but I do keep a good edge on them. A Harbor Freight coping saw and a few more chisel chops later and the pins were cut. 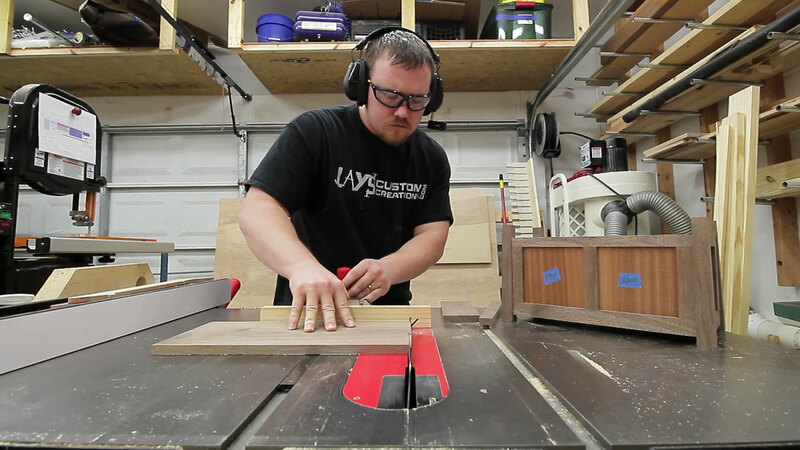 I don’t own any hand tools to efficiently cut the bottom tray groove so I just made a shallow pass with the table saw to establish the groove. The pin boards can be run right through but to prevent the groove from showing on the outside of the completed box on the tail pieces I had to do a non-through pass on the table saw and clean up the ends carefully with a utility knife. 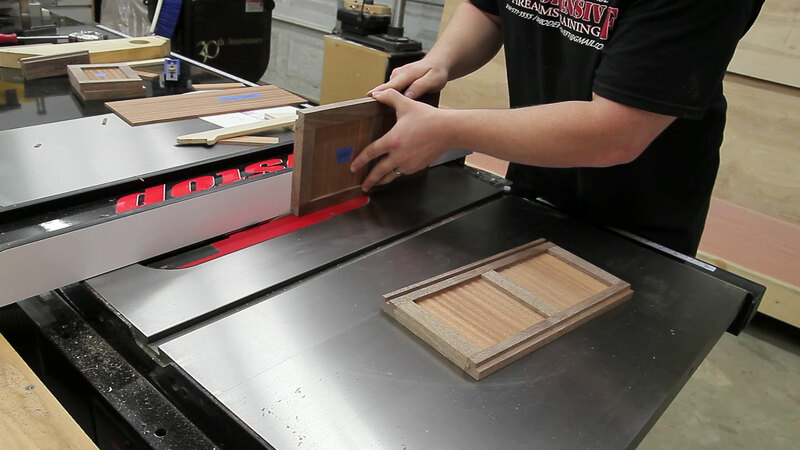 Before assembly I carefully planed (not by hand) the bottom panel to fit the 1/8” groove. 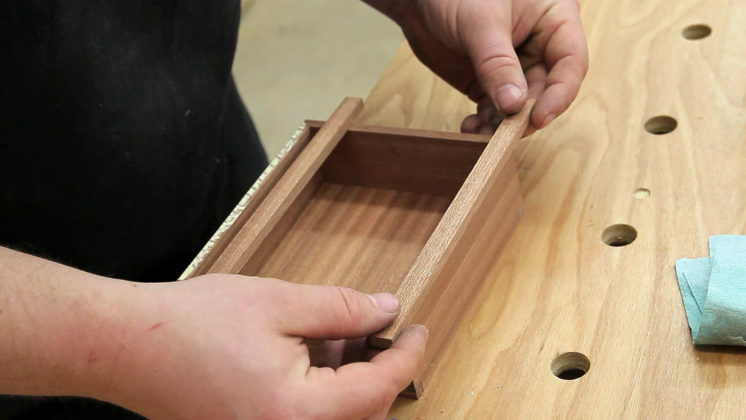 A little glue and some clamps later and this becomes a simple, strong tray. 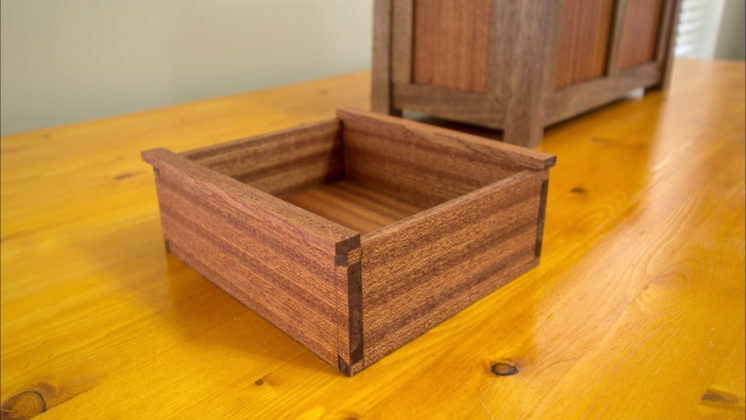 To allow the tray to slide back and forth on the previously cut rabbet I added a couple strips of sapele to the top of the tray. Just wood glue to hold them on. 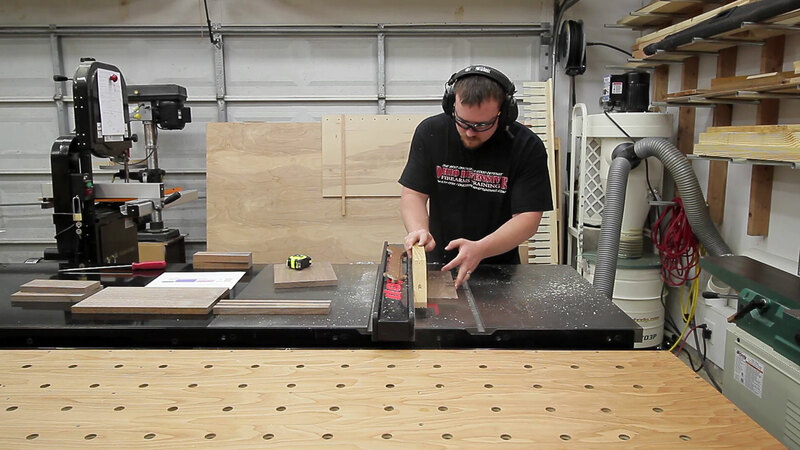 After that dried in clamps I cut the runners flush with the sides of the tray and cleaned everything up with a scraper. Man what a handy little tool this is. I’ve drastically cut down on my sanding time since getting one of these. Don’t make the same mistake as me and not get one until several years after you started woodworking. They are super inexpensive (regardless of where you buy it) and pretty easy to use. 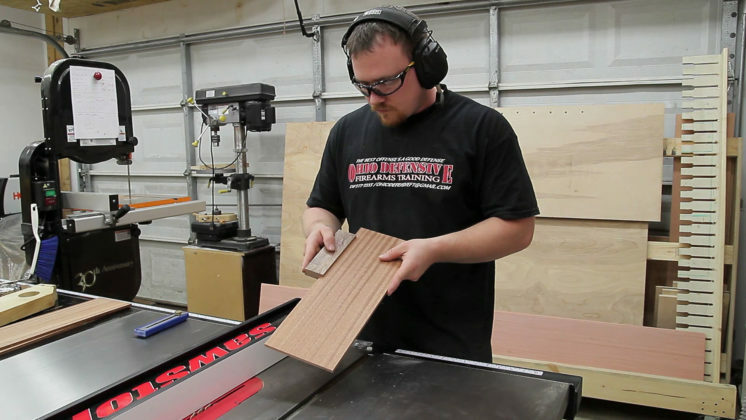 Keep it sharp and you can sometimes skip the sanding step all together as the wood surface can feel glass smooth after using one. 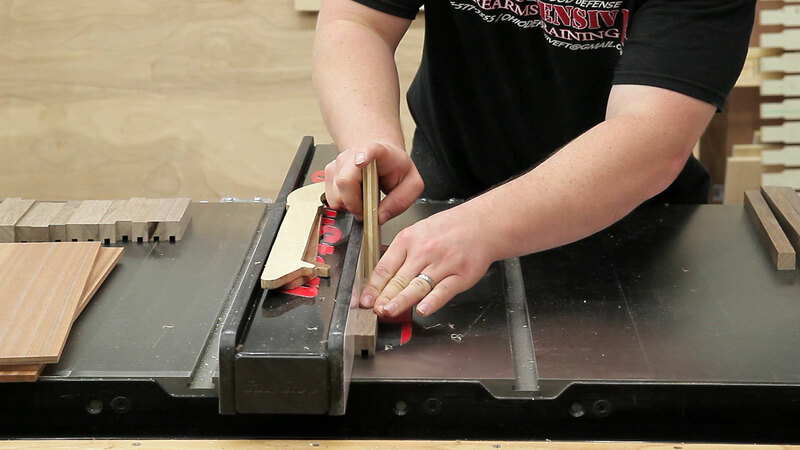 The Wood Whisperer has a good video on how to keep them sharp. Its a rewarding feeling knowing the tray fits and slides properly. All that’s left to do is a light clean up with sand paper as needed and apply the finish. For a finish I went with natural Danish oil. 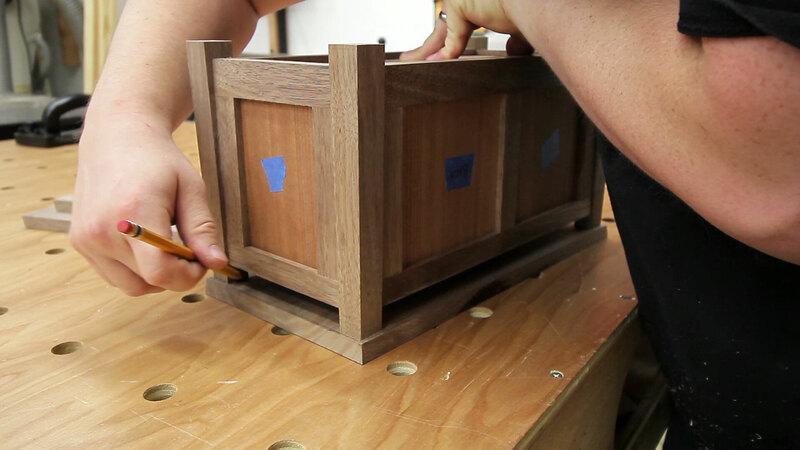 It really makes the grain pop without the film look of lacquer or polyurethane. Brush it on, let it soak in for a few minutes, and wipe it off. The tray turned out great. Not perfect but much better than I had anticipated for being hand cut. I’m really happy with how this project turned out. I wasn’t too sold on the sapele and walnut combination on some pre-project testing but in the end I’m glad I went that route. Love that combo of the two. Great work as always man. Hi Jay, I am a big fan of your site, projects and Youtube production style. Keep up the great work ! As an ER RN AND fellow woodworker I have seen my share of people come thru the ER doors with significant (life changing) injuries sustained from our beloved power tools. Frankly on this video, your scared the crap out of me ! 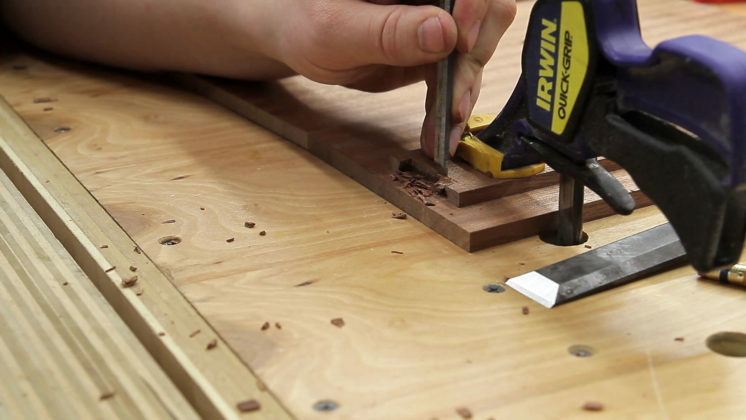 I know you have a SawStop, BUT PLEASE, PLEASE, PLEASE, use more push sticks or hold downs to make those close cuts ! We all want you around to continue the great content you provide ! Hey Dave. What are you referring to? Every cut I made was controlled. Hey Jay- the cut I saw that caught my attention was when you were cutting the smaller walls of the inset box (maybe they were rabbets?) 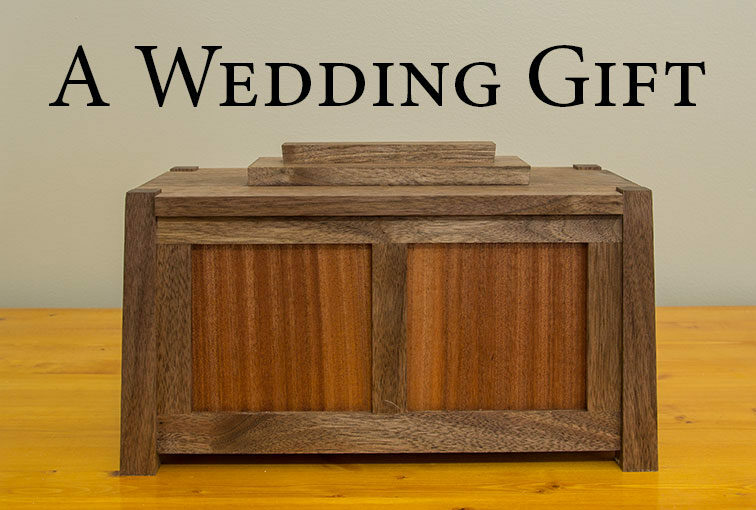 but you were holding the workpiece similar to the photo “gift box 17” above. That aside, I really thought you did a fantastic job with this project, the editing and videography. Thanks for sharing- it makes me want to make a box! Hi Jay, With all due respect, “control” is a matter of perspective. The specific sections that made me worry were 1:25-1:28, 1:34-1:38, 2:34-2:40. Your hands/fingers were on top of the stock as it passed OVER the blade. By having a push stick and/or a feather board you separate your body from direct contact with the stock. 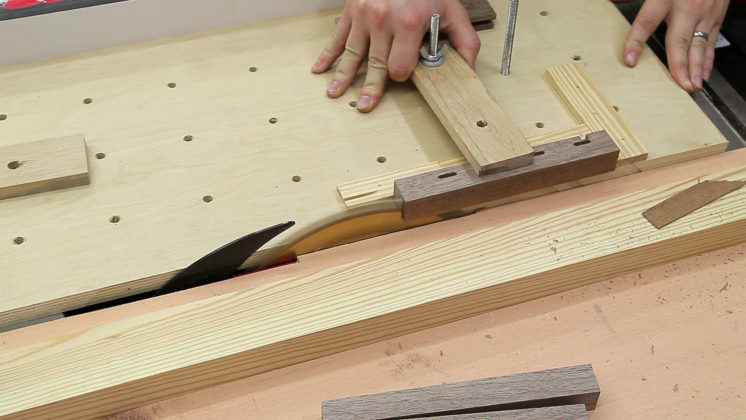 A knot, an accumulation of sawdust, a broken pencil point between the stock and the fence can alter the direction of the line of cut and in a fraction of a second…. More importantly (IMHO) you are a mentor to many. 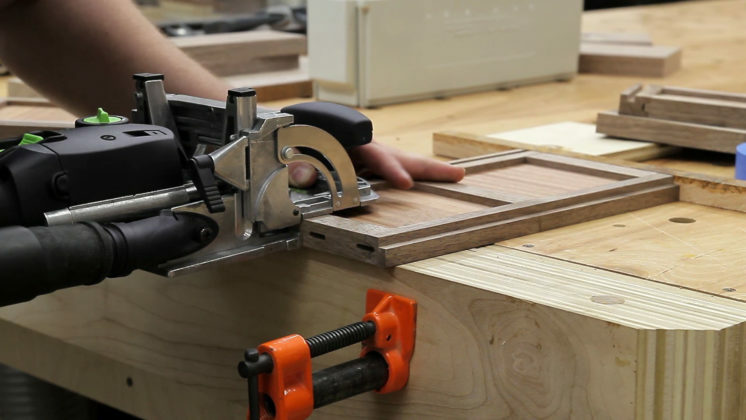 For those who do not have the safety net of a Sawstop or the experience that you demonstrate may not be able to successfully reproduce the same cuts without disaster. These are MY thoughts. Consider them for what they are. Let others weigh in. Keep up your great work. Hey Jay, small glitch on your page — when I click the box at the bottom, I do NOT get the plans page. Rather I just get the larger version of the box image. Sounds like your browser is still being served a cached version of this page. I corrected the issue a couple hours ago so it should be working now. Thanks for letting me know. Good to see some of the boards out to use. You do great work, Jay! Alz I can say is WOW what a terrific project and wonderful video. I have three unfinished box projects that’ll never get done cause they’re junk. Love how you finish stuff and get things done. You should be very proud by this project. I think there will be rich rewards for your endeavors someday. I like the fact that you show your cuts and setup. A lot of folks won’t do that anymore. 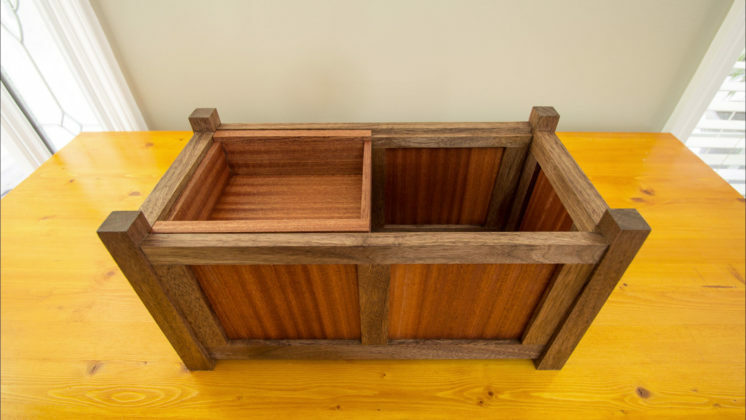 Jay that is a thing of beauty my friend.You should work more in hardwoods and if the cost is to high, I think you would have no problem in selling the Items, you may even make a profit .I know no one out there would object to that happening as a matter of fact it would be welcomed. 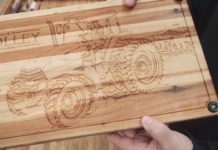 I would love to have such a well make piece of wood art in my home.I use the term wood art as you are a craftsman and project like this one would defiantly stand the test of time .It will still be around in a hundred years from now still being enjoyed Jay. Beautiful work Jay. I love the way you laid the grain in the legs. It gives the illusion they are tapered and I thought for a start they were until I looked closer and realised it was the grain that gives the illusion. Thanks for your feedback John. I believe every cut in this project was done in a very controlled manner. 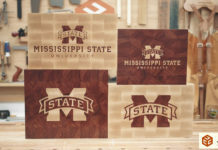 Hi Jay, That is beautiful work you have done with the box, I think Marc “The Wood Whisperer” better look out. I’m sure your friends will treasure this gift forever. But like some others I have concerns with the safety of some of your methods while machining this job. 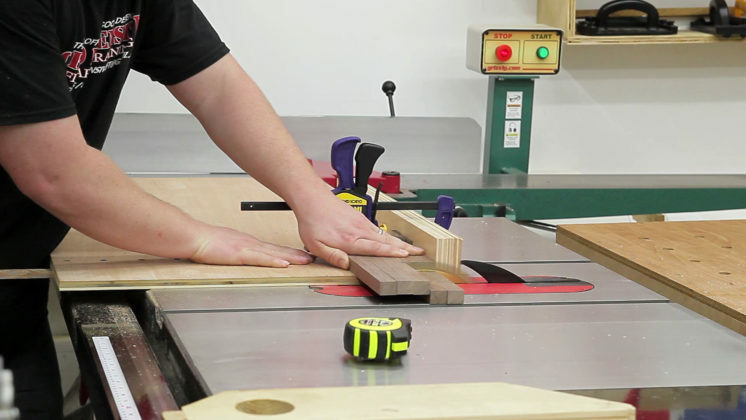 I’ve worked in the woodwork industry of over 40 years on machines far larger than those in the homework shop, so have a huge respect for the damage any machine can do to me….. quicker than I can say “Cut” and I’ve had my share of near misses as well. I make it a rule to keep my fingers more than a hand width from a blade; use Push-sticks or pads. Remember a machine will wait a lifetime to kill you. Hey Pete. No matter what happens there will always be a better way to do something when you have the opportunity to look back and reflect on something. But if I had to do it over I wouldn’t change a thing. I had a tight layout due to material size limitations so I milled them in the best order for the size board I had. At the end of the day it’s all about everyone being safe in their own shop and being responsible for their own actions. I believe every cut in this project was done in a very controlled manner. Thank you for your input. Hi Jay, I know what you mean, It can be tricky to jiggle a limited amount of timber to fit the job. Having the luxury of extra timber to work with isn’t always an option. I have to admit the other day I trimmed some scrap 70 x 45mm (2.75 x1.75 in) blocks 110 mm (4.25 in) long for a job. To flatten & square these blocks on a jointer would have been suicidal, so did that part by hand plane, but trimmed them to size on my table saw. With the blade lowered to just over half thickness and using push sticks this was done without trouble. Sure experienced woodworkers like ourselves can (sometimes) get away with “hairy” methods like that privately in our workshop. But being on a public forum as you are, you need to be mindful that those less experienced may think that what you show is normal safe practice, but not realise just how quickly it can get out of control. It may only need a comment that this is not a recommended method. As you say it’s up to the individual to look after their own safety. Very well said. Everyone knows their shop the best, but realize that others are just lending their inputs, too. Especially an ER RN. Jay, outstanding project!! 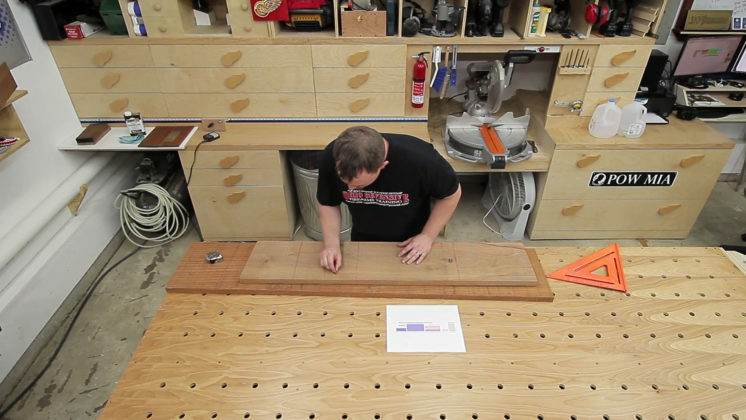 Don’t think I am brave enough to try this in hardwood but would surely try this in yellow pine. I don’t think my skills are there yet. Still think its a great box. Love the dovetails!! Holy Cow!!! That’s awesome!!! 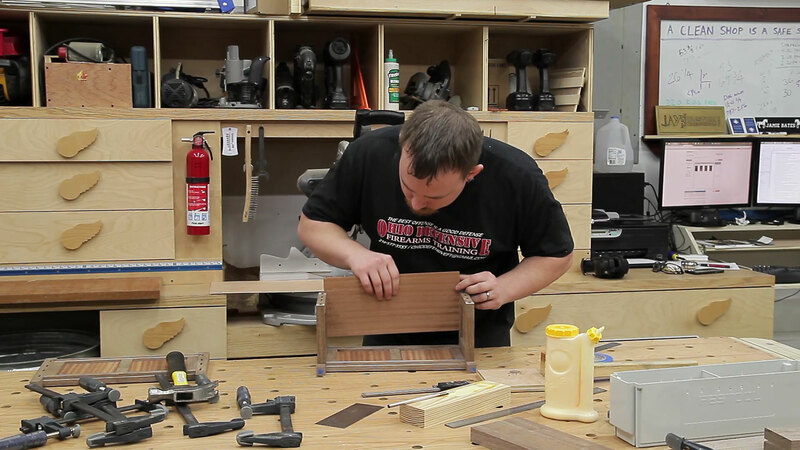 With the music in the back ground it made the hand cut dovetails seem almost stress free. Keep up the good work. I wish I had your talent. You make very intricate projects seem simple…but I know better. Great job jay! Awesome project! I agree with you on the safety subject as well. You did everything right and it is everyone’s own responsibility to make sure they are staying safe in their own shop! Love the box! May have to make one soon! What a beautiful gift! Wonderful wood combination and very delicate joinery. Crazy beautiful dude. Always impressed by your skillz!!! BTW, loving my assembly/outfeed table modeled after yours!!! You got some lucky some relatives! That box is amazing. 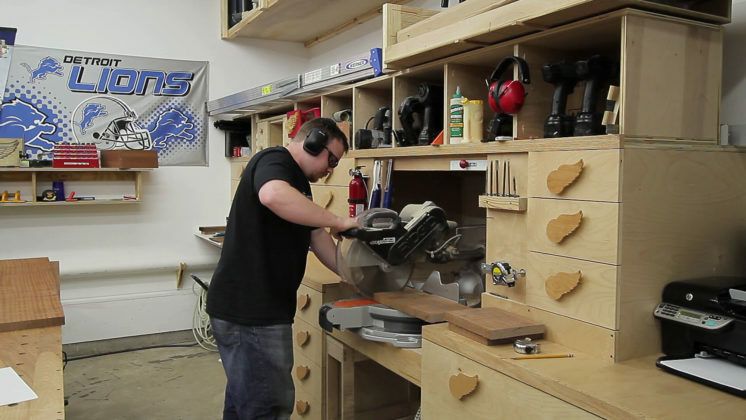 I was impressed with your free-handing the bandsaw cuts. The box is great and I love the contrast. I lived near Jackson MS until a few months ago and was making a cradle for my granddaughter last year. Bought a lot of sapele (probably from the same place you did) to use with some walnut I already had but was concerned I wouldn’t like the contrast. So I ended up buying walnut from them as well and making the cradle all from walnut. 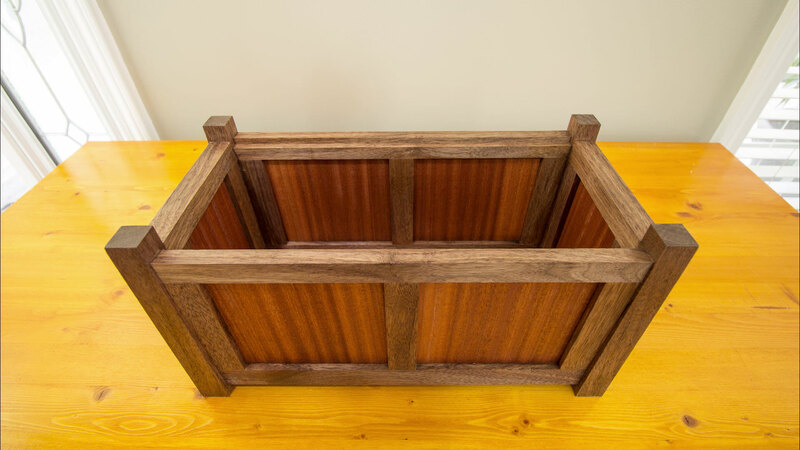 I’ve still got the sapele boards (and some walnut) so I my try one of your boxes.